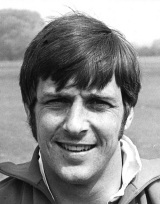 Barry John is arguably the finest outside-half of all time. During his short playing career he was revered in Wales as "The King" and feared by opposition defences as a majestic yet unpredictable pivot behind the scrum. John made his international debut against Australia on 3 December 1966, while a student at Trinity College, Carmarthen. In his early years with Wales, he played in an inconsistent side that did not bring out the best of his mercurial talent. It was during this time that he first began playing alongside Gareth Edwards, sowing the seed for one of the most famous half-back partnerships in rugby history. John was at his most potent when awaiting the fearsome long pass of Edwards. He was able to vary his game instantly, either taking on the first-phase defence with his footwork or waiting for the ball to arrive in his hands before unleashing his centres into space or fooling the defence with his deft kicking. Following two years in the Welsh setup, John was selected for the 1968 Lions tour to South Africa, but a broken collar bone ended his tour after only the first Test. His return to international rugby from injury was as part of a Wales team that dominated northern hemisphere rugby during the 1970s. While the team was filled with stars, Edwards, JPR Williams, Gerald Davies and John Dawes to name but a few, attention was lavished on John by Welsh fans. Following a Welsh Grand Slam in the 1971 Five Nations, John was selected for the Lions tour to New Zealand later that year. It was on this tour that John shone brightest of all. His display of tactical kicking in the first Test, terrorising All Black full back Fergie McCormick, was a masterclass that set in motion the famous series victory. This performance was followed by one of his most famous tries in the third Test at Wellington. John dummied a drop-goal before ghosting through the All Blacks' defence, stepping inside the final tackler and dotting down under the posts in front of a stunned crowd. John left New Zealand having scored 30 of the Lions' 48 points over the four Test matches, orchestrating a 2-1 series victory. The feat has yet to be repeated by any touring Lions side. Only a year after returning from the Lions tour, Barry John retired from rugby. At only 27 he was still at the height of his powers, but had become weary of the "goldfish bowl" of Welsh rugby. The final straw came for him when a young girl curtsied to "The King" as he opened a bank. Describing what he called "the monster of fame" as his reason for leaving his rugby career behind, John vanished from the public eye altogether. He was followed by another great fly-half, Phil Bennett, but John's ability to do the unexpected and the majesty of his control meant that he was a one-off in the eyes of Welsh fans and the wider rugby community.